Former Top Chef chef-testant Dale Talde tosses deep-fried chicken wings in a sweet and spicy kung pao-inspired sauce, tops them with chopped peanuts, cilantro and scallions, and serves them with buttermilk ranch sauce. 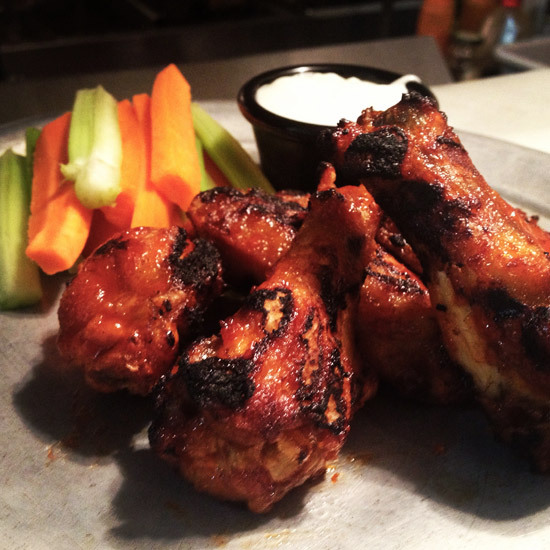 The chef also serves a variation on classic Buffalo wings at Pork Slope, his new dive bar and comfort food joint. 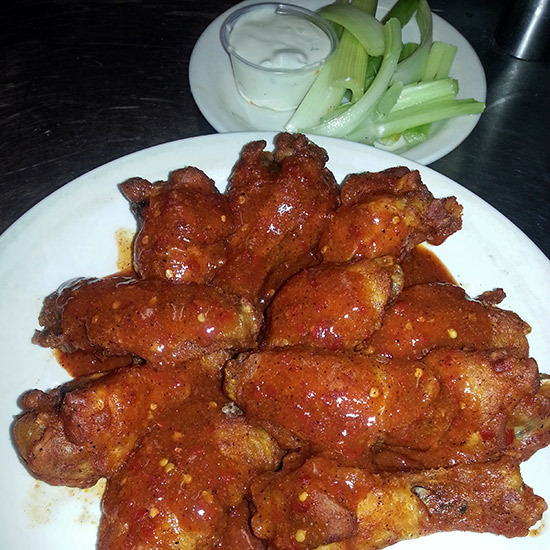 The wings are coated in rice flour, then deep-fried, sprinkled with cayenne pepper and tossed in a hot sauce made with smoked garlic, Sriracha, Frank’s RedHot, honey and butter. Chef Andy Ricker came up with the recipe for his amazing Thai chainlet’s crispy-tangy signature dish after trying fish sauce wings at a roadside stand in Saigon. He scribbled down his guess at the ingredients on a paper napkin, which he carried with him until the first Pok Pok opened. 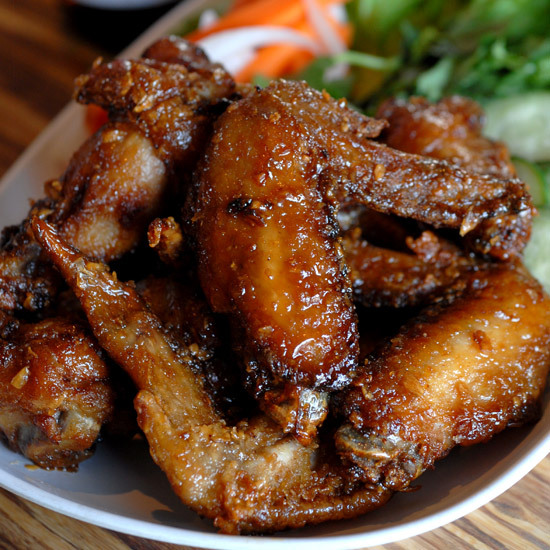 Ricker marinates the wings in fish sauce and palm sugar, then deep-fries them and tosses them in caramelized Phu Quoc fish sauce and garlic. Chef and partner Chris Lilly is a legend on the pro barbecue circuit, with multiple championship wins at the prestigious Memphis in May competition. 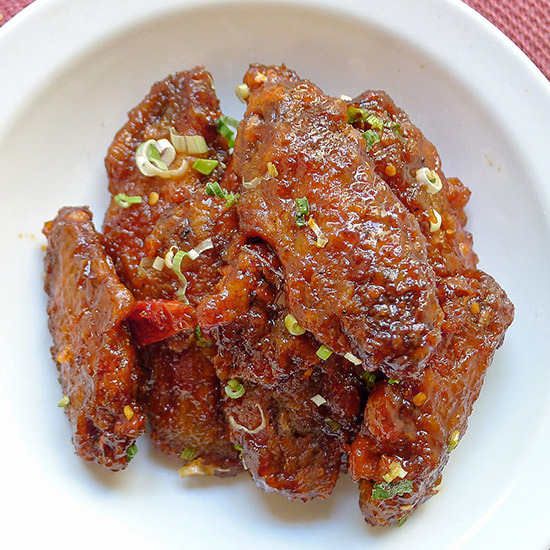 He marinates his fantastic chicken wings in a spicy apricot sauce for about four hours before tossing them on the grill. Superstar chef Emeril Lagasse so dearly loved the wings a Vietnamese cook once made for him at NOLA that he put them on the restaurant’s menu in 2000 and hasn’t taken them off. The wings are stuffed with a mixture of ground pork, chopped shrimp, mushrooms, onions, celery, cilantro and fish sauce. After they’re baked, they’re dredged in flour and fried in peanut oil in a wok, then served with a garlicky homemade hoisin dipping sauce and jalapeños. Barbecue legend Mike Mills is best known for his perfect baby back ribs seasoned with his signature Magic Dust, a secret blend of 18 herbs and spices with hints of garlic, paprika, mustard powder and a little sugar. 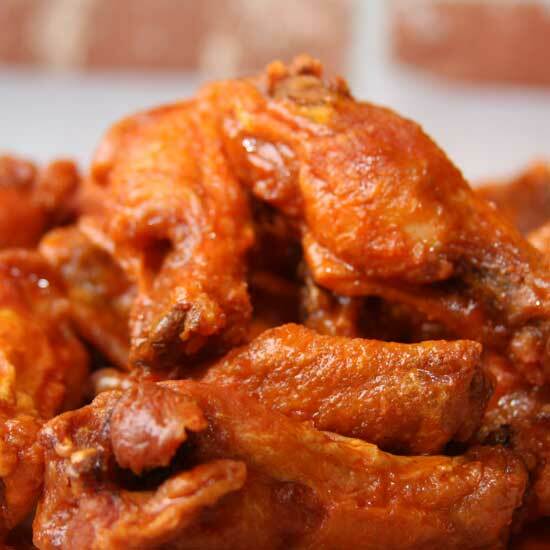 He also employs the proprietary mix as a finishing touch on phenomenal chicken wings that are smoked over applewood, then grilled and tossed with a spicy house-made wing sauce. To top it off, they come with ranch or blue cheese dressing. Genius chef José Andrés reimagines classic Buffalo wings as an elegant appetizer at his stylish restaurant in the chaotic SLS Hotel at Beverly Hills. 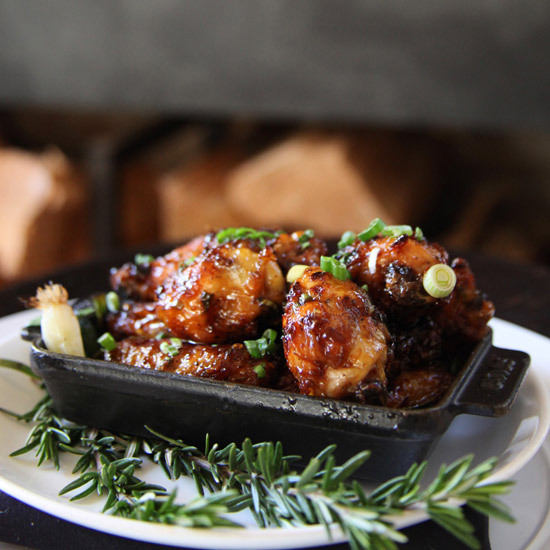 The wings are confit and deboned, then dredged in flour, pan-fried and dipped in a spicy demi-glace made with chicken broth, Tabasco and sugar. 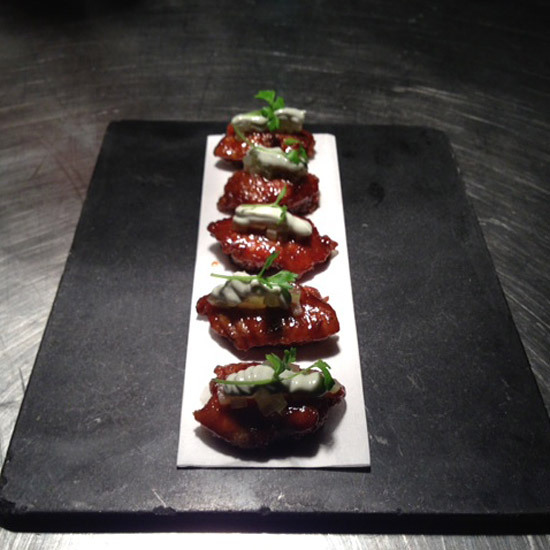 Topping the wings: blue cheese cream, compressed diced celery and celery sprouts. Scott Drewno heads this Wolfgang Puck restaurant, which takes up three floors of the Newseum, just off the Mall. 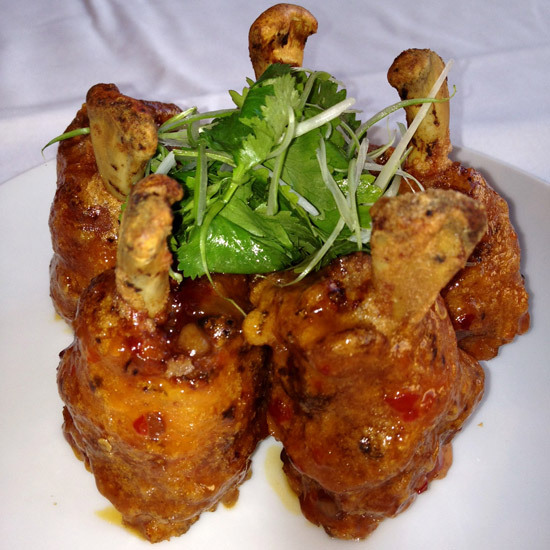 The downstairs lounge serves Asian snacks including these superb chicken wings with house-made chile sauce. 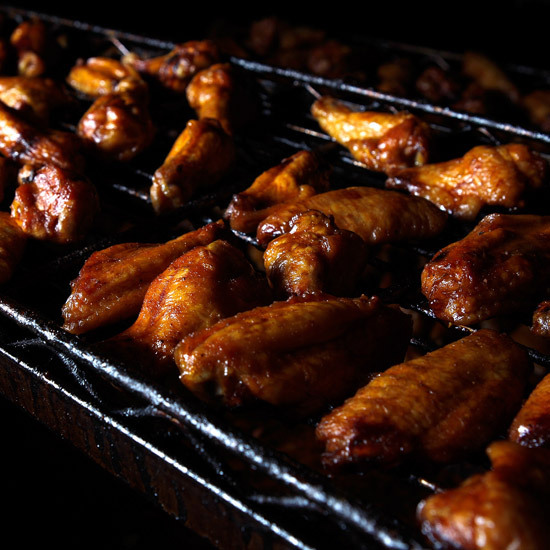 Drewno marinates the wings for at least eight hours in ginger, scallions, crushed red chile flakes and peanut oil. Next, the wings are lightly dredged in cornstarch, sautéed in peanut oil and tossed in the fantastically sweet and sticky sauce made with whole chile pods and chile sambal. “When they’re first put down in front of you they look unassuming, like really crispy wings with little flecks of red chile,” says F&W’s restaurant editor, Kate Krader, about chef Danny Bowien’s incendiary wings. “But they have that kind of a dry, slow heat that’s just magnificent. They’re searing hot in a way that makes your mouth happy.” Instead of creating a crispy crust with flour, Bowien lightly poaches the wings then freezes them (which makes the skin expand) and deep-fries the frozen wings with beef tripe. 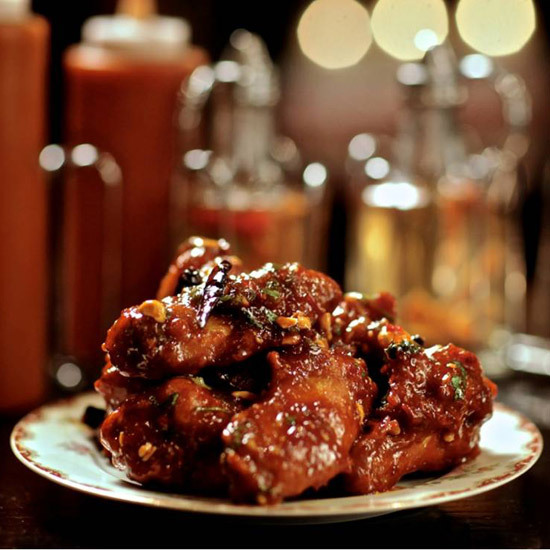 He tosses the wings in a spice blend of Sichuan peppercorns, fennel, cumin and coriander, and serves them with dried red chiles, cilantro, scallions and sesame seeds. 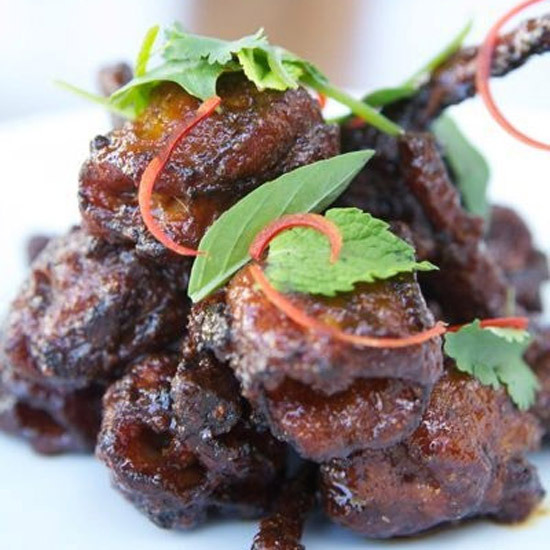 Bees from the ranch’s on-site apiary make the honey used in these wings’ sweet, sticky and salty soy-and-honey glaze. 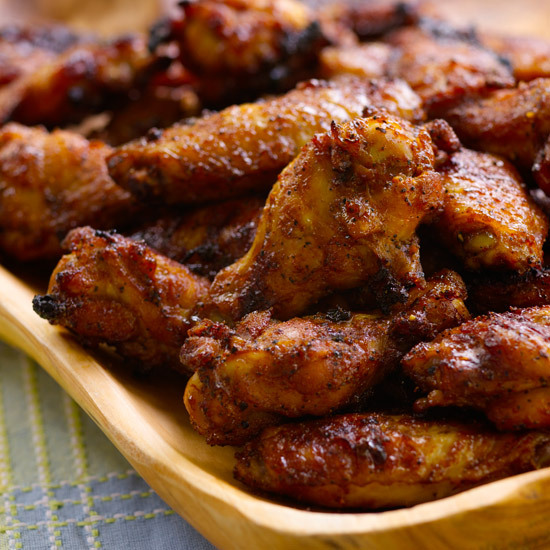 Chef Tim Wood avoids the deep fryer and opts to broil or grill the honey-chile chicken wings, which develops fantastic flavor. At his modern Southeast Asian follow-up to Father’s Office, chef Sang Yoon marinates wings in a mixture of ginger, garlic, scallions, onions, Chinese light soy sauce and kecap manis, an intense, dark, sweet Indonesian sauce. 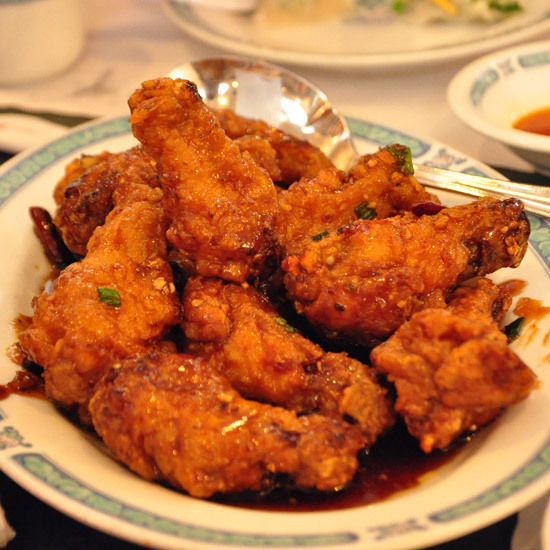 The marinated wings are dusted with flour, deep-fried twice in peanut oil and tossed in a sauce made with kecap manis and soy sauce, black vinegar, ginger, garlic, scallions and onions. 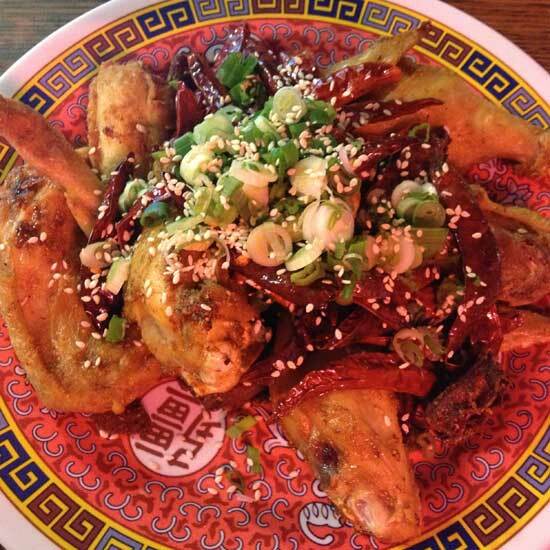 The fantastically sticky wings are then finished with Yoon’s own spicy Sichuan salt. 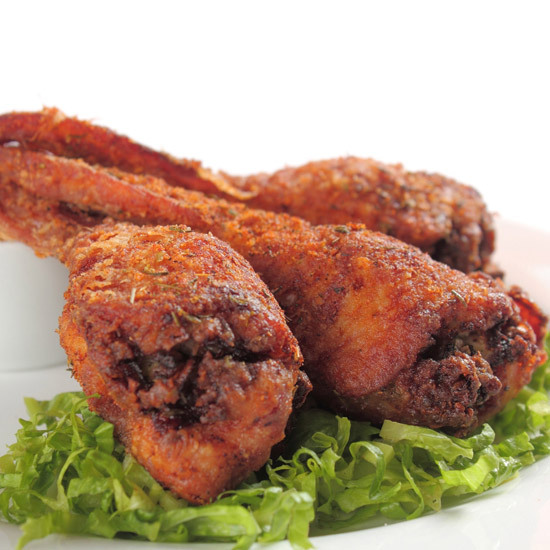 “The go-to wings here are called Hiromi’s Katsu, panko-breaded with tonkatsu sauce. But you can’t go wrong with the triple-fried KFC (Korean Fried Chicken) or the Fiery Hot Fried Wings, coated with a house mix of ground chiles, black pepper and garlic. Heat freaks will be glad to know the place has a wall of hot sauces, including frightening ghost chile options." 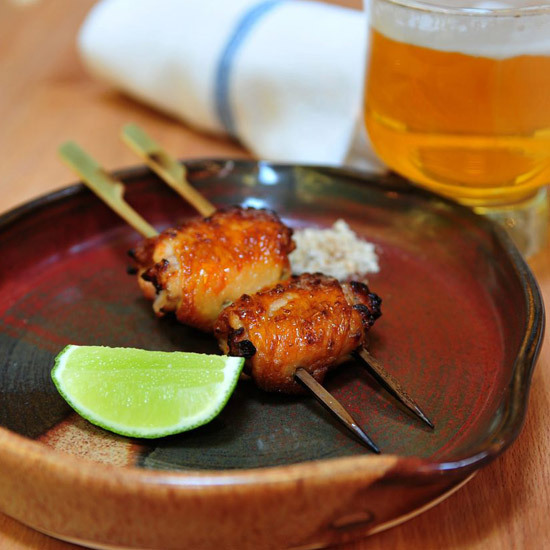 This Korean-inspired recipe is fiery and a little bit sweet. 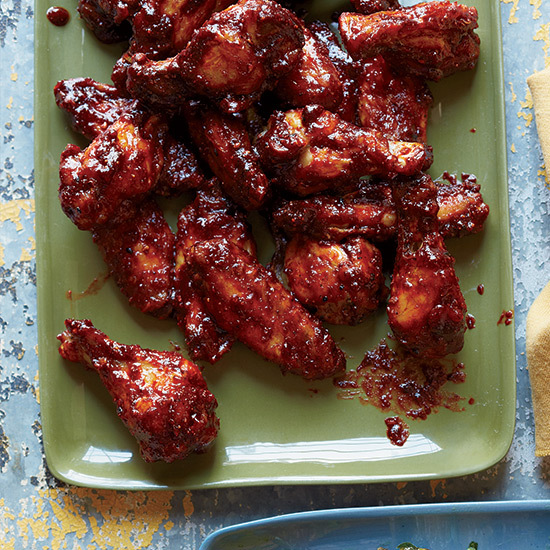 Co-owner Lisa Shin of Wing Wings in San Francisco also uses the versatile sauce as a marinade for pork and as a dip for cucumber spears.